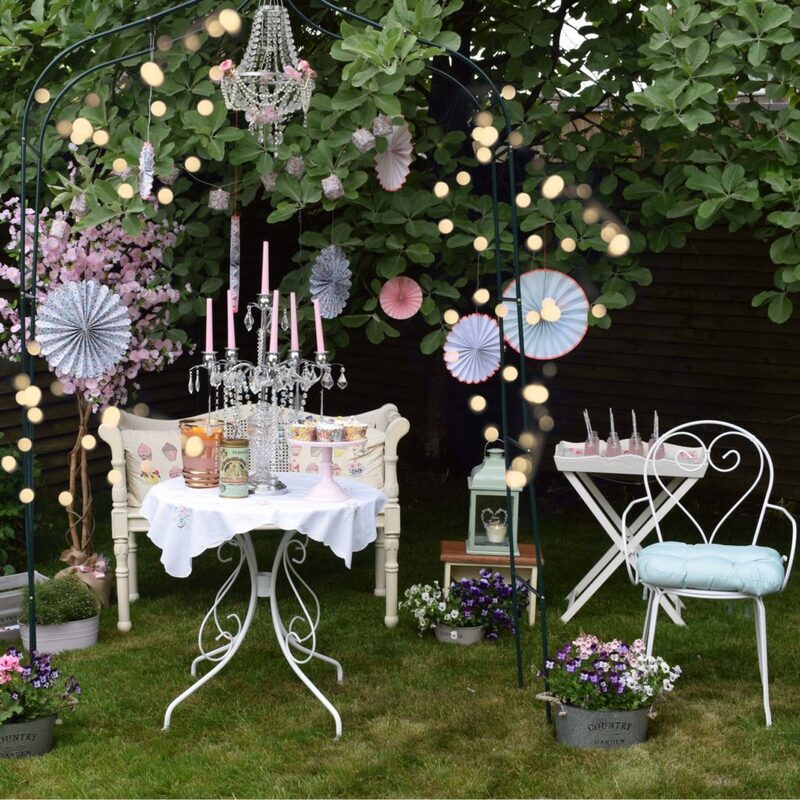 Warm summer days are perfect for outdoor entertaining and I love to create pretty little areas in the garden where people can sit and relax . 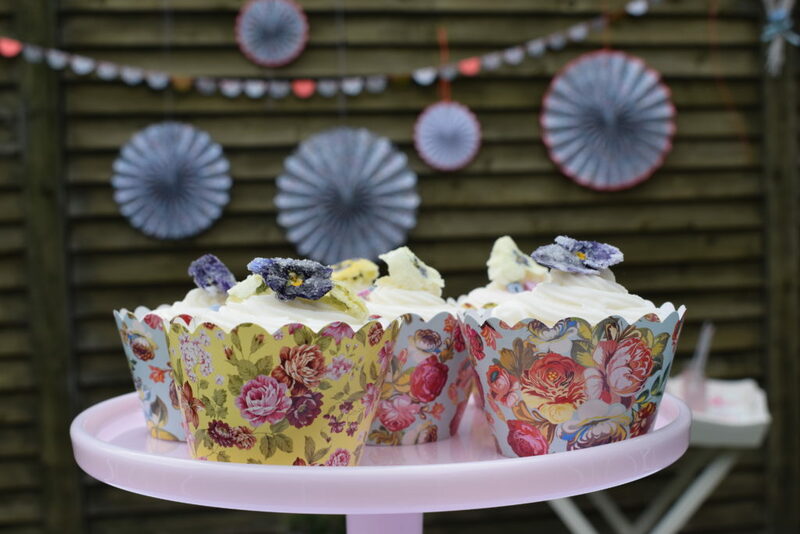 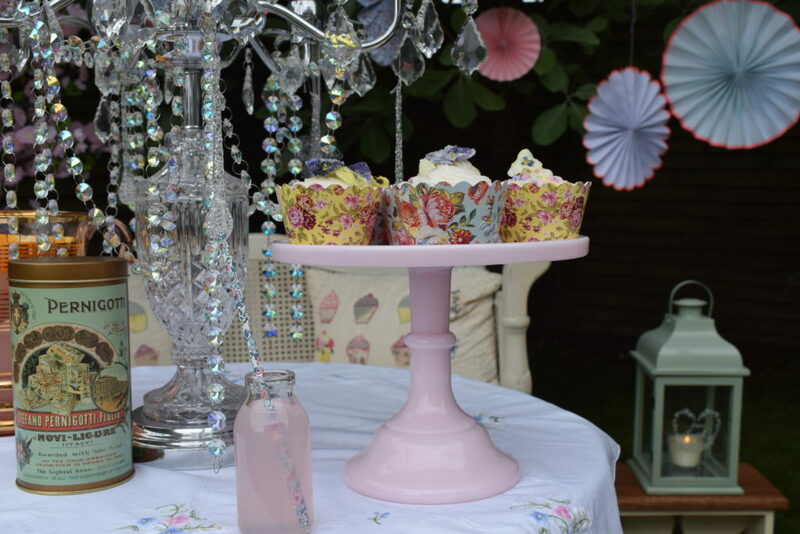 For this tea party I used the gorgeous Liberty party decorations from Party Pieces as they are so pretty and ideal for summer. 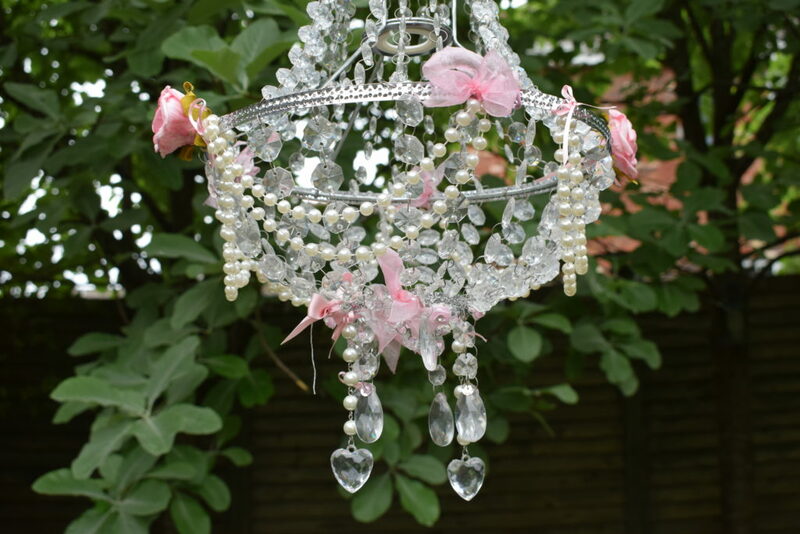 I wanted it to look like an outdoor room so I hung a little chandelier at the bottom of the garden next to the trees and put out a bench with cupcake cushions. 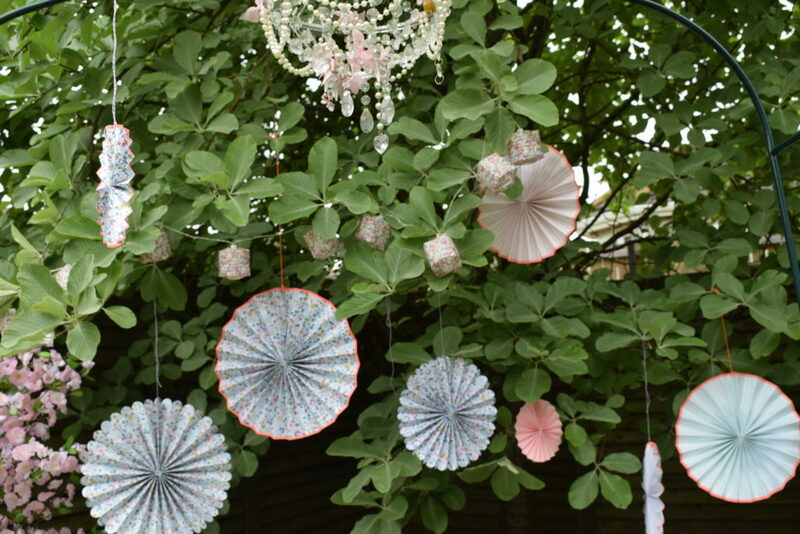 I then hung the Liberty pinwheels from the trees to create a pretty backdrop and was really pleased with how it looked. 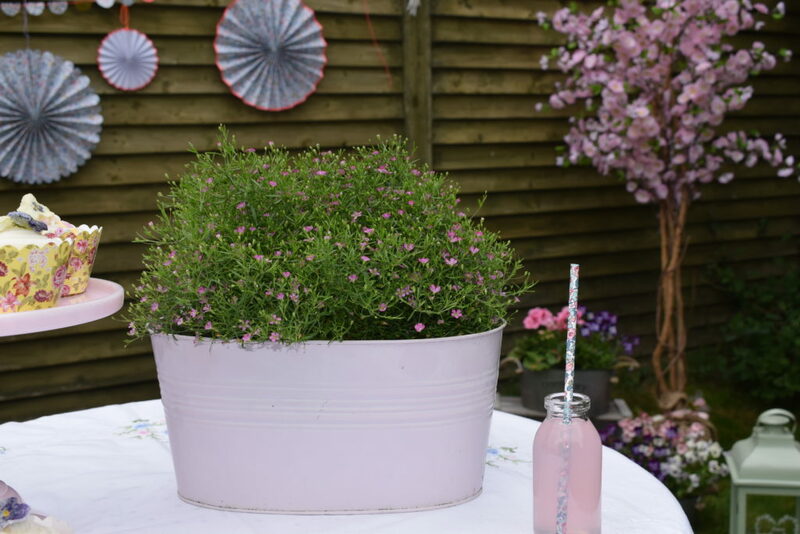 I tend to use lots of little pots of flowers in the garden as they are ideal for moving around to suit the occasion and I dotted them around the seating areas to add some colour. 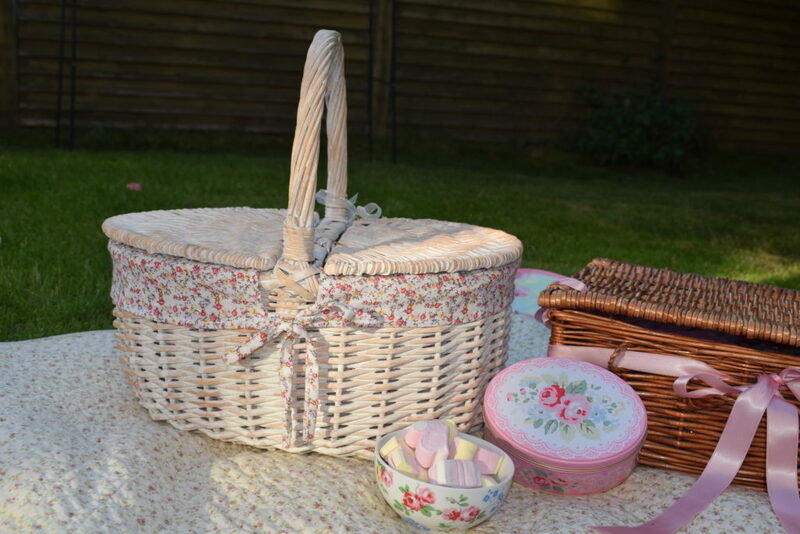 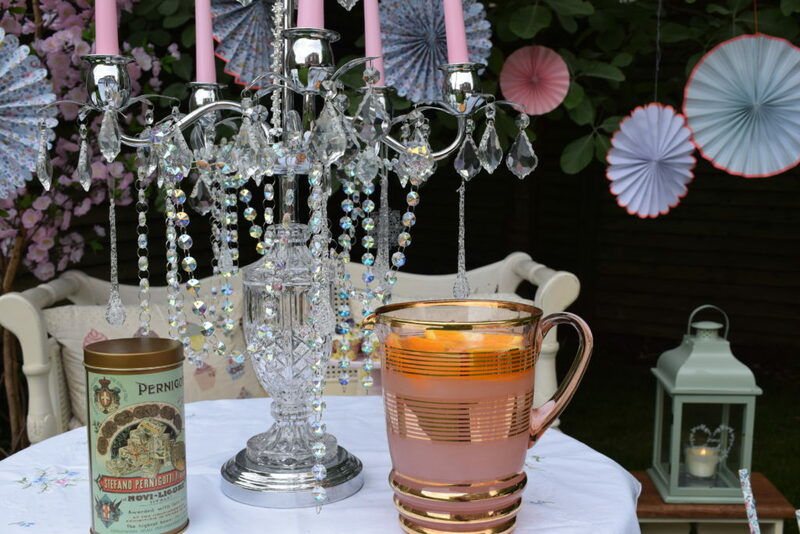 I have a little white bistro set for the garden from B&Q and I covered the table with a pretty embroidered vintage tablecloth and sat a candelabra on it for some extra glamour. 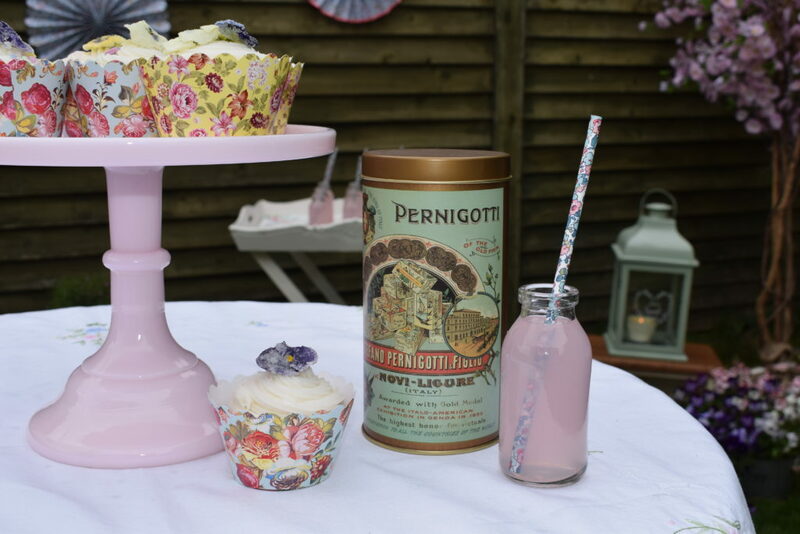 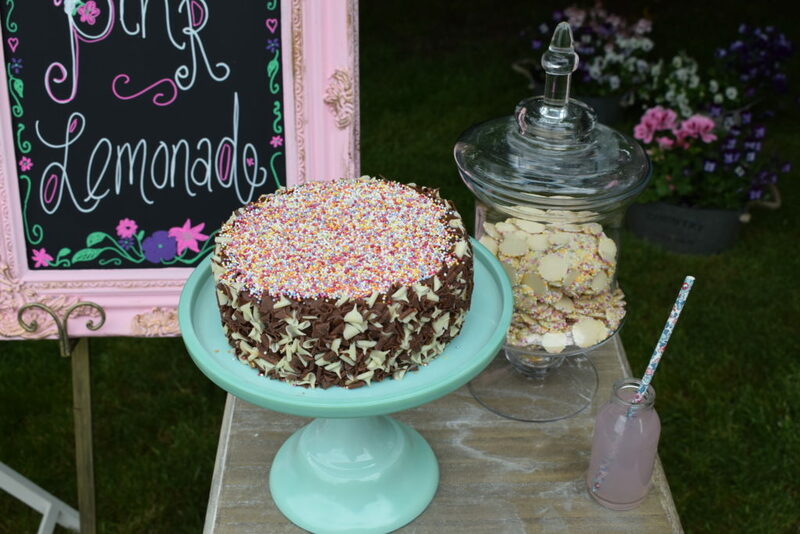 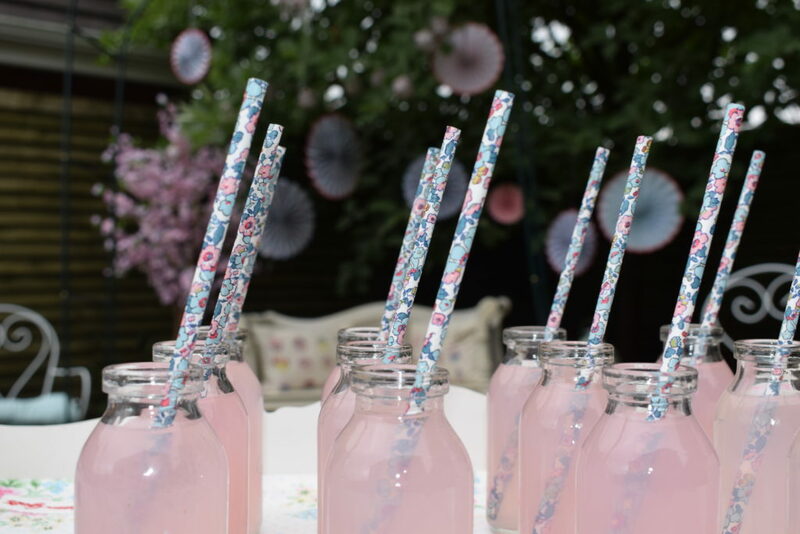 I borrowed my mums lovely butlers tray for setting out the little bottles of pink lemonade and used the Liberty straws from Party Pieces to match the pinwheel decorations. 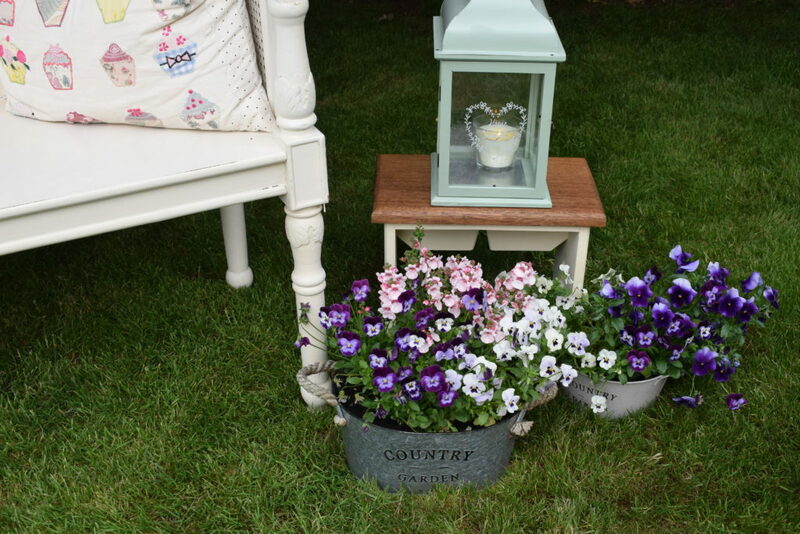 Although this area was the main focal point I also decorated other parts of the garden to continue the flow throughout and put out picnic rugs and chairs so that there was plenty seating available. 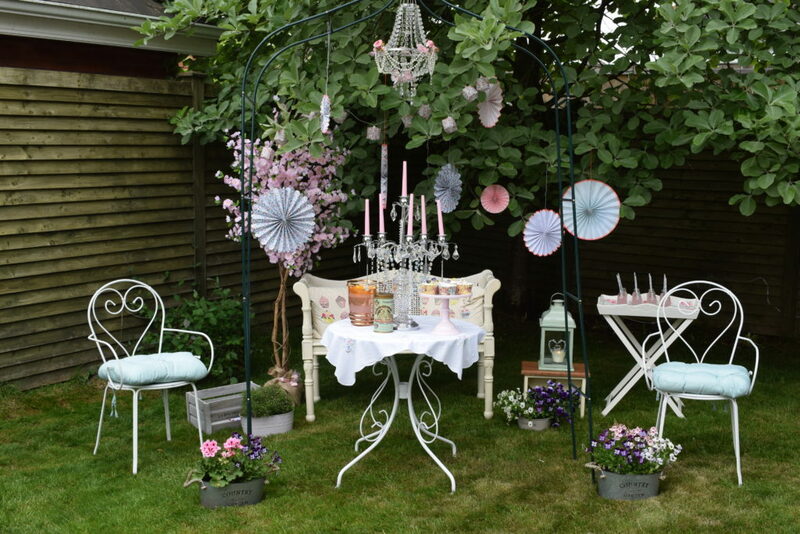 I always like to make sure that there are seats for everyone but outdoor entertaining is definitely more relaxed as people tend to wander around getting their own food and drinks etc. 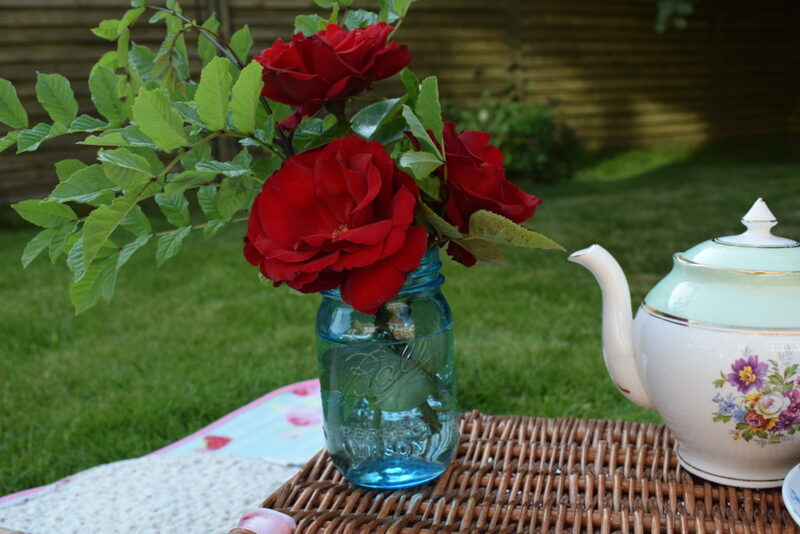 It’s nice to pick some flowers from the garden and place them in jam jars and on this occasion I cut some roses and put them into mason jars which looked really pretty and summery. 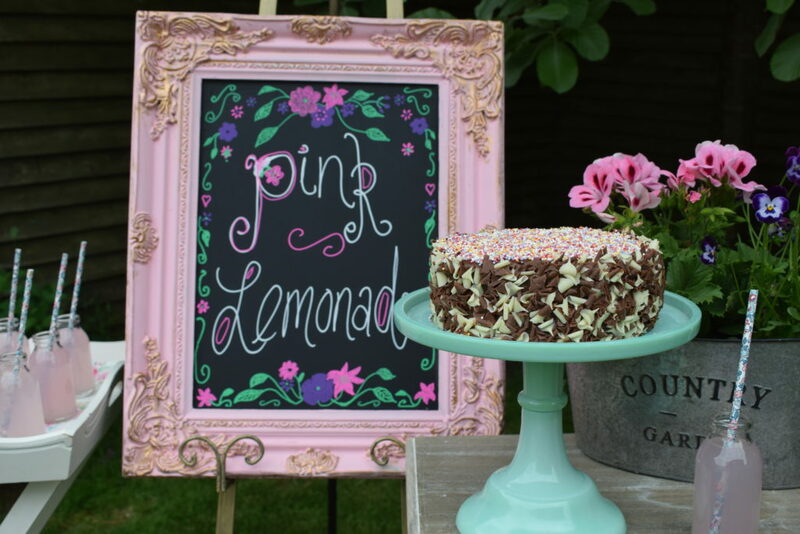 I had bought a cheap silver framed mirror ages ago and finally found the time to paint it pink and gold and then used blackboard paint to turn it into a little chalkboard. 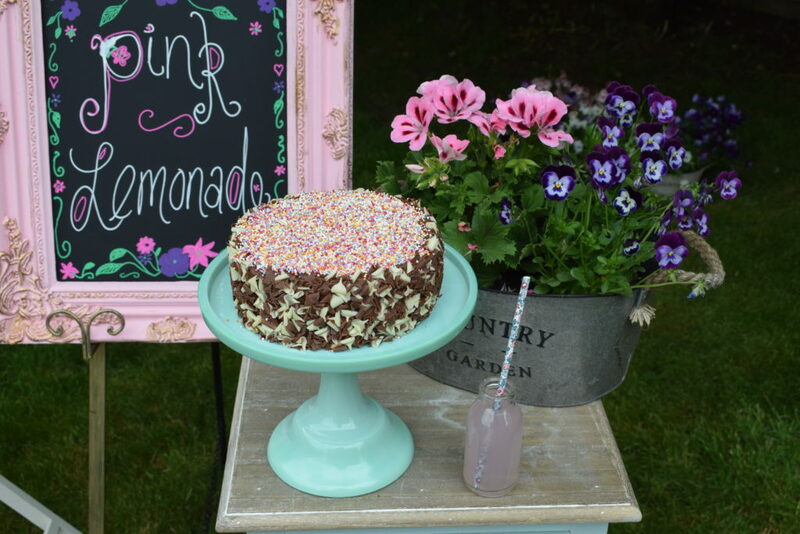 I often use chalkboards at weddings and parties to write personalised messages on and I really love how this one turned out. 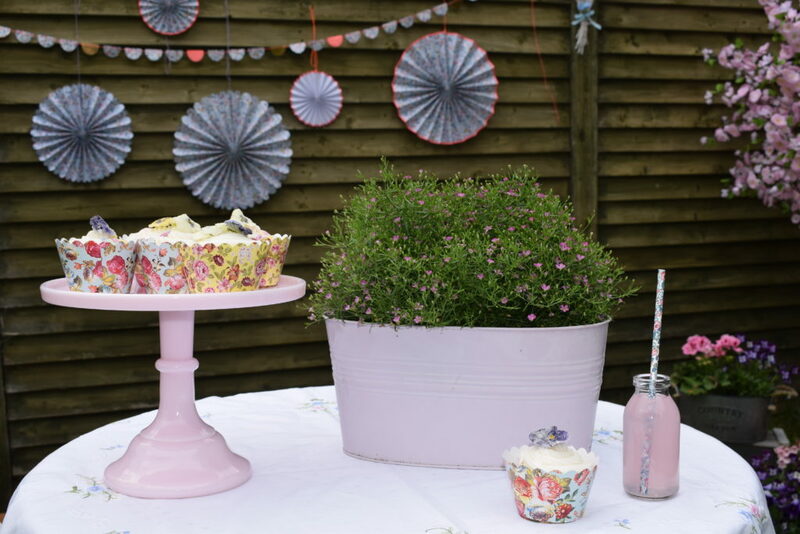 I also put some pinwheel decorations onto the garden fence and hung the pretty Liberty bunting alongside them. 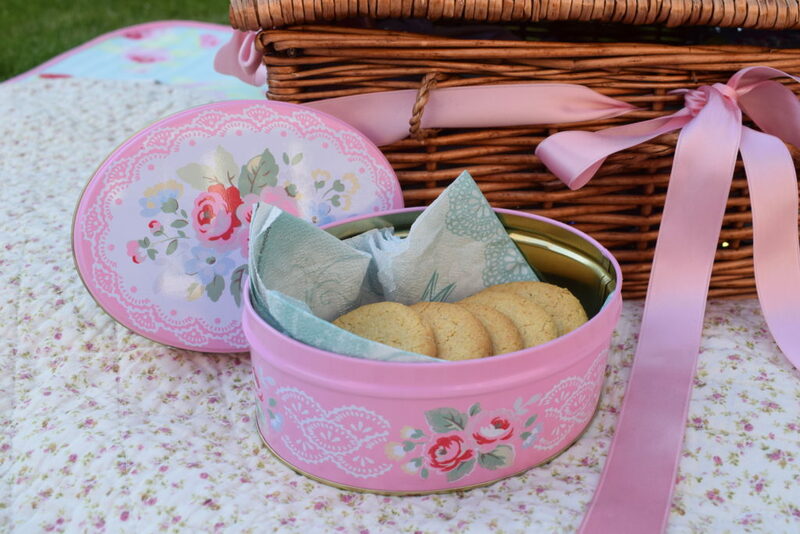 I have an obsession with pretty tins and sat out a few with sweets and biscuits for people to help themselves. 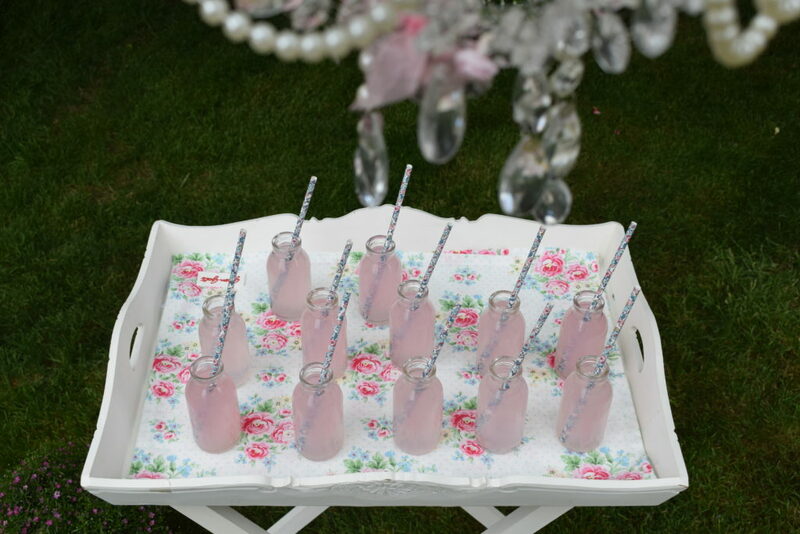 I have recently acquired some beautiful milk glass cakestands in pink and green and these were perfect for a summer teaparty! 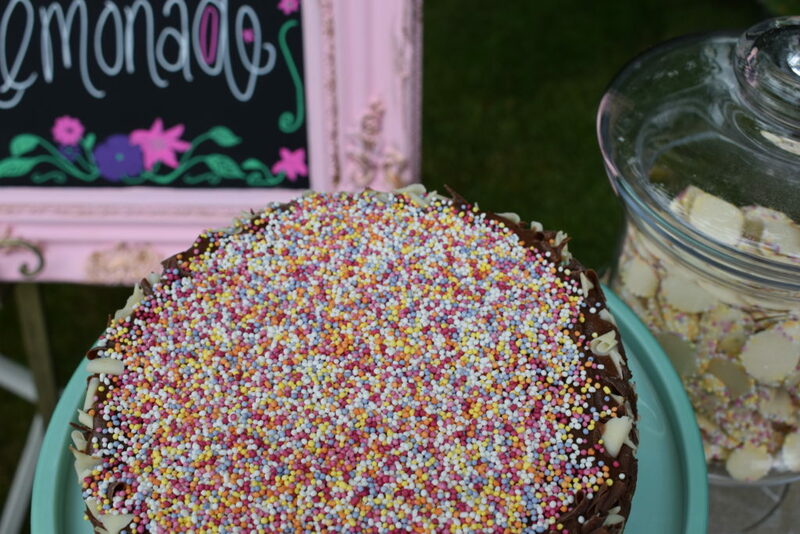 I had intended to bake a chocolate cake but in the end decided to go for the easy option and bought one from good old Marks & Spencer and covered the top with sprinkles and it was most delicious! 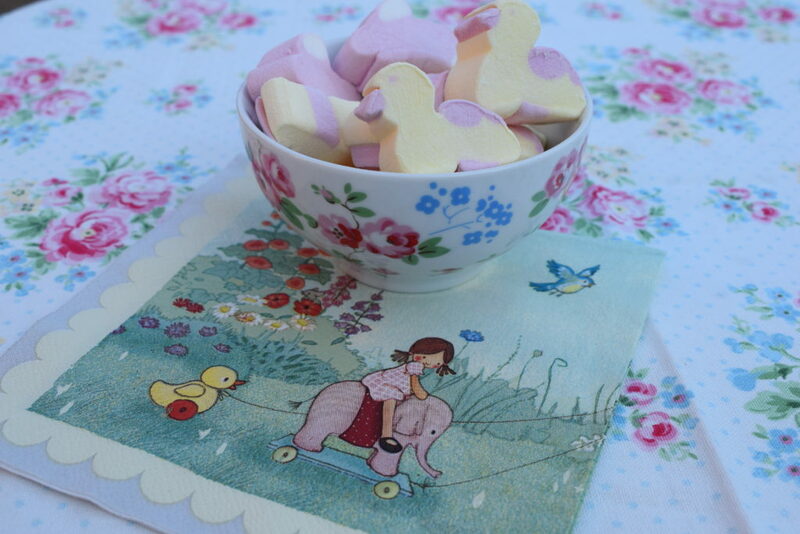 I used the cutest paper napkins EVER from the fabulous Belle & Boo and the little duck and bunny marshmallows matched them perfectly! 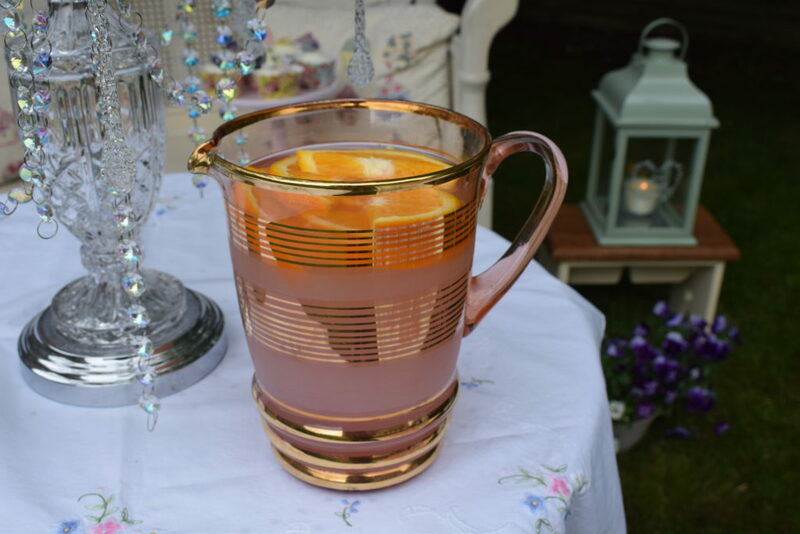 A handy tip if you don’t want to spend a fortune on the expensive French lemonade is to mix some Robinsons pink grapefruit diluting juice with plain lemonade and it tastes just as good and looks lovely in a jug or a drinks dispenser with some slices of orange and lemon. 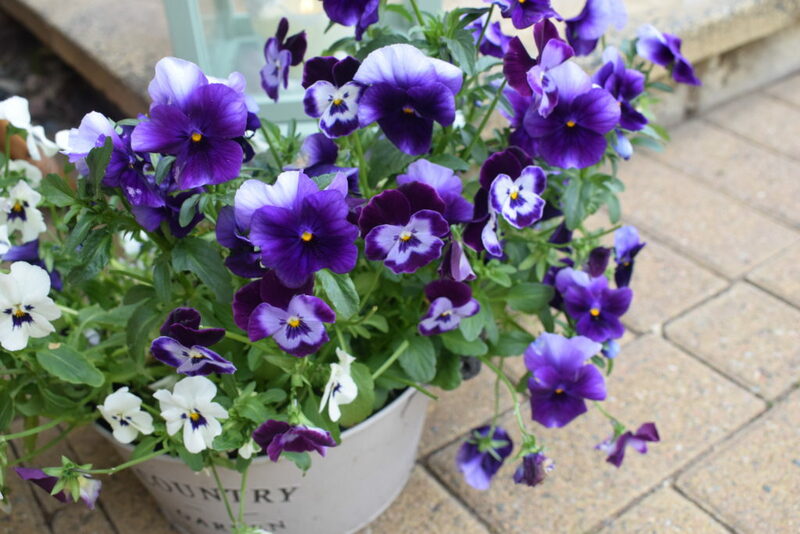 Hope you’ve enjoyed the pics and thank you for reading! 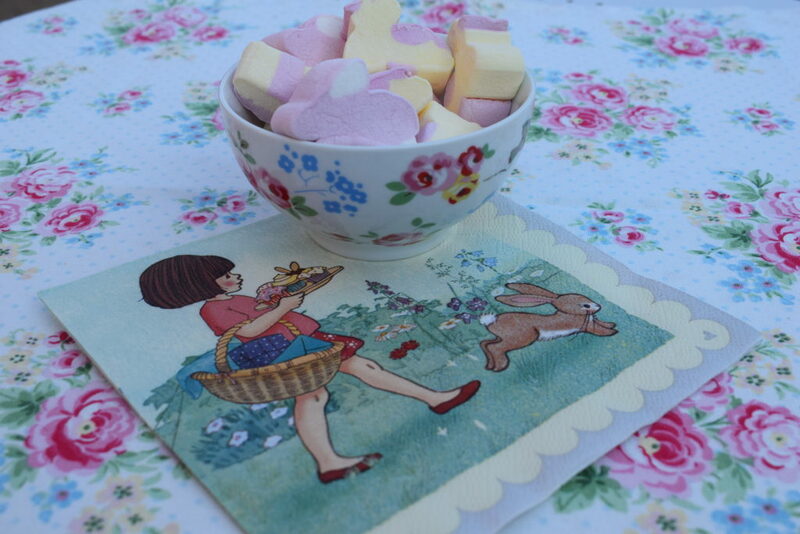 Louise you are fab!.. 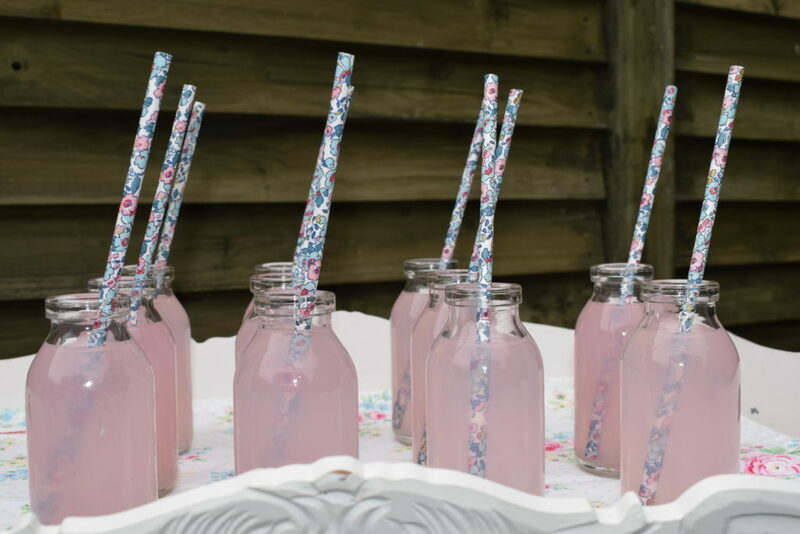 Everything you do has a unique style. 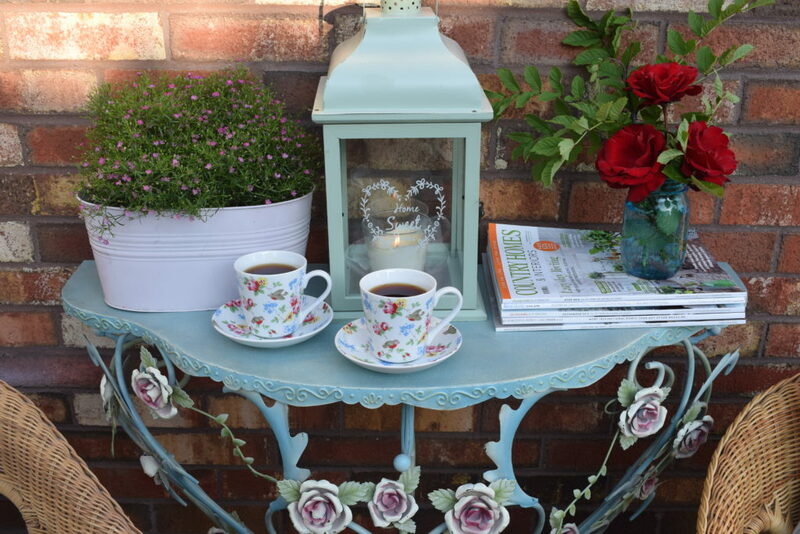 This comes through in every picture with great thought and time put into every detail. 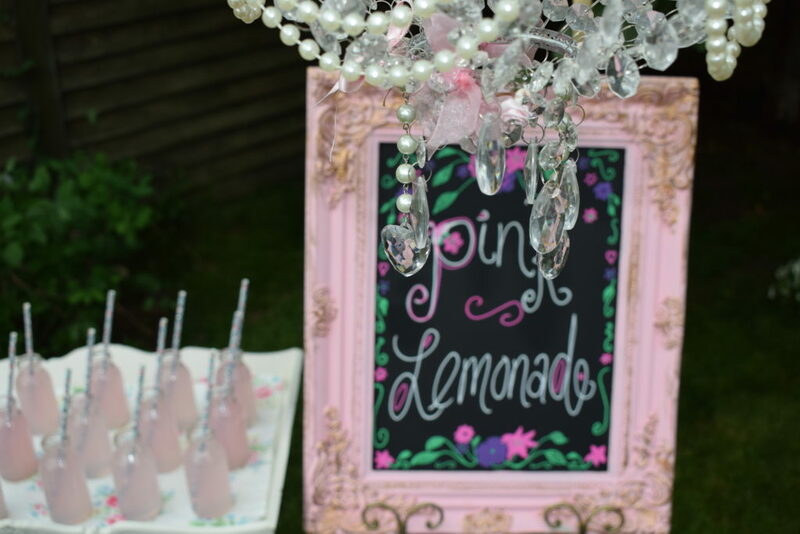 This sums up you up a individual.